It’s Boxing Day. A time to put on your Christmas jumpers and escape from the family. In recent years it has been a tradition that I head off to football with varying success. The TBIR records show that in the last five years we’ve only had one postponement, although last year’s encounter between Lewes and Bognor Regis should never have been completed due to the weather, and consequently cost the life of my car (long story about cam belts and water). Football and Boxing Day have been Christmas necessities long before Terry’s brought us the Chocolate Orange. The fact that I head off to two games a week during the other 51 weeks of the year is irrelevant. Boxing Day is all about renewing local rivalries and sharing them with your loved ones. Some of the biggest crowds of the season are seen on Boxing Day, despite the lack of public transport in many areas of the country. In recent years I have experienced the likes of Burton Albion, Carshalton Athletic v Sutton United, West Ham and of course, Lewes. But this year, weather permitting, it was about “the big one”. One that all of the locals were talking about. In the land of Northern Steve you are either an Imp or a Cod Head. Unless you support Manchester United, Forest, Liverpool, Leeds United, Peterborough United or even Grantham Town. The forthcoming Boxing Day derby was the talk of the town. Despite falling out of the Football League, both Lincoln City and Grimsby Town still remain big clubs in a smallish pond. That pond, otherwise known as the Conference Premier, is getting too big nowadays for the ex-league clubs, and faced with even stiffer competition to return to the Football League, it is sink or swim for many. Stockport County, just a five years after winning the playoffs to the third tier of English football, found out to their cost how difficult the Conference was last season and now have fallen even further, looking forward to local derbies against the likes of Stalybridge Celtic. Every season it seems the same names are tipped for being promotion challengers – Wrexham, Cambridge United, Luton Town and Kidderminster Harriers. Add in the mix newbies Aldershot Town and Barnet as well as clubs rising up with a financial backing such as Forest Green Rovers and Alfreton Town meaning in summary “it’s bloody difficult”. This season Grimsby Town are giving a go, coming into Christmas in third place with games in hand to mount an assault on the summit, currently occupied by Cambridge United. Lincoln City, on the other hand, were once again trying to keep their head above the relegation zone. Twelve months ago the situation was almost identical, although the Mariners were top at Christmas coming into the game at Sincil Bank. In that game, Grimsby won 4-1 in a lunch time kick off in front of a season-best 5,700 before all sorts of fun and japes took place in and around the city centre for the rest of the day. Surely history wouldn’t repeat itself this year? 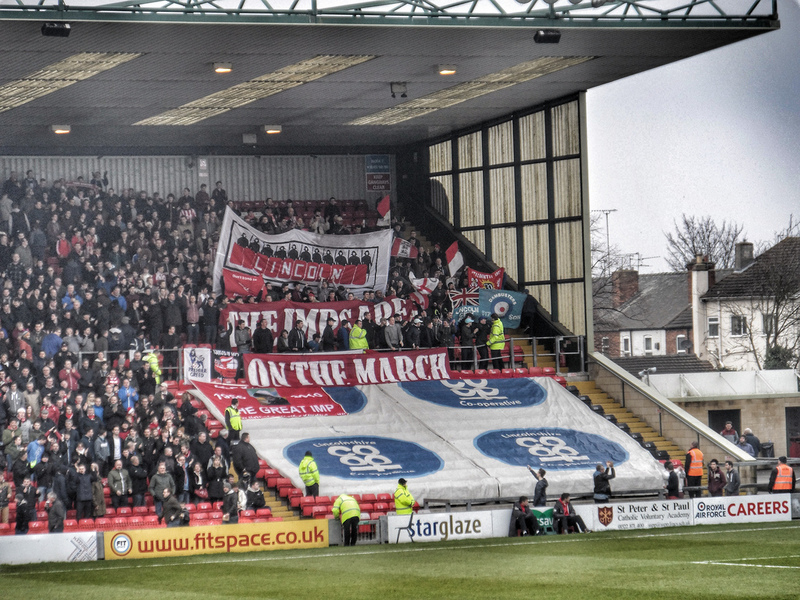 Lincoln’s support had been in the press for the wrong reasons “up here” in recent months. A massive brawl prior to the game versus Nuneaton Town led to front page news and then a few weeks ago eleven fans were given custodial sentences and banning orders after pre-match trouble against Luton Town. Tensions would sure to be high for the visit of their fiercest rivals. But it’s Christmas – a time for peace and goodwill. The presence of a new jumper and a Santa’s hat would surely be more effective than riot police? 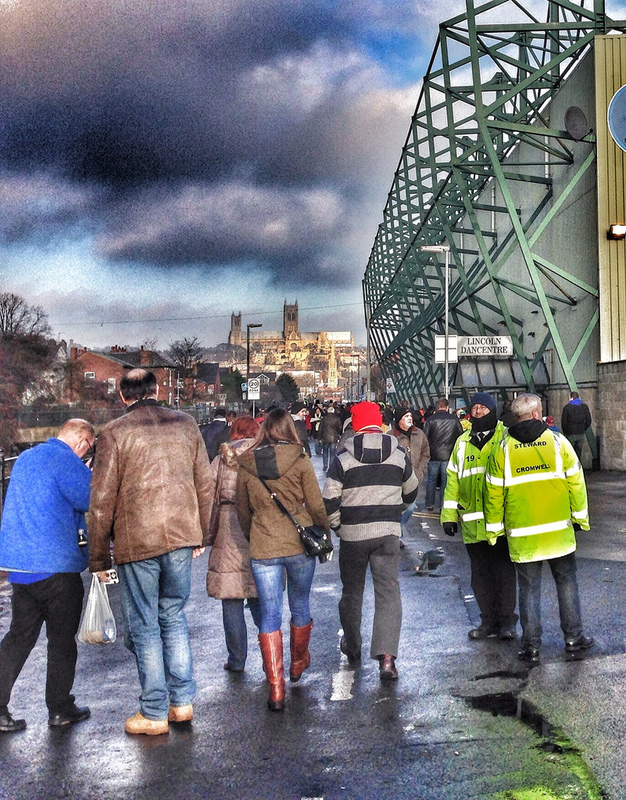 Lincoln City 0 Grimsby Town 2 – Sincil Bank – Thursday 26th December 2013 It wasn’t a good day to be a Lincoln fan. It was an even worse one for Northern Steve being a Imps/Rooks/Hammer who had to miss the post-match pint to return home to entertain his in-laws (me excluded of course). Lincoln were toothless in front of goal, simply not being able to turn any possession into clear chances on goal. They had 15 off target attempts in a frustrating ninety minutes that saw them play out the last few minutes with ten men. It was quite clear that Imps boss Gary Simpson had told his team to “get into them early”, judging by the quickest booking I had seen in many-a-year when Danny Rowe flew into a Grimsby defender with just 16 seconds on the clock. A definite yellow and it if wasn’t for the sensible head of Grimsby’s Pearson there would have been handbags flying within the first few seconds – nobody would have wanted to have seen a 22-man brawl by the edge of the Lincoln fans in the first minute of the game would’ve they? Ten minutes gone and Grimsby were one-nil up. Despite some early Lincoln pressure, mainly due to the Delap-esque throw-ins from Miller, Grimsby took full advantage of confusion in the Imps penalty area from a corner, allowing Ross Hannah to power home a header. His choice of running to celebrate in front of the home fans wasn’t the best decision, but still allowed a few fans who had indulged a bit too much over Christmas to shed an ounce or two as they ran down the steps of the stand to give Hannah some seasonal greetings. The next fifteen minutes saw poor timed challenges galore as the referee issued three further yellow cards, giving the game a nice little edge. However, a second Grimsby goal in the 40th minute by Craig Disley sent the 1,700 away fans into Boxing Day delight and effectively sealed the victory with over a half of the game to play. With the temperature dropping like a stone we needed something to keep up going. For future reference I wouldn’t recommend the “Premium Hot Dog” at £3.50 which was possibly the most tasteless thing I have ever eaten. It wasn’t unpleasant, just absolutely devoid of any flavour. You could have got better value eating the paper napkin in was wrapped in. But we weren’t here to eat, drink or be merry. We had a game to watch. Lincoln were sure to come out fired up and give this a go. But they didn’t. The game descended into a series of niggly fouls and blocked shots with Lincoln unable to break down a solid Grimsby defence, and Grimsby unwilling to commit more men forward. The final act was the sending off of Lincoln’s Jake Sheridan for a bad tackle. Quite why the home fans clapped him off is beyond me – it was rash, late, high and dangerous. Fair play though to the fans on both sides. 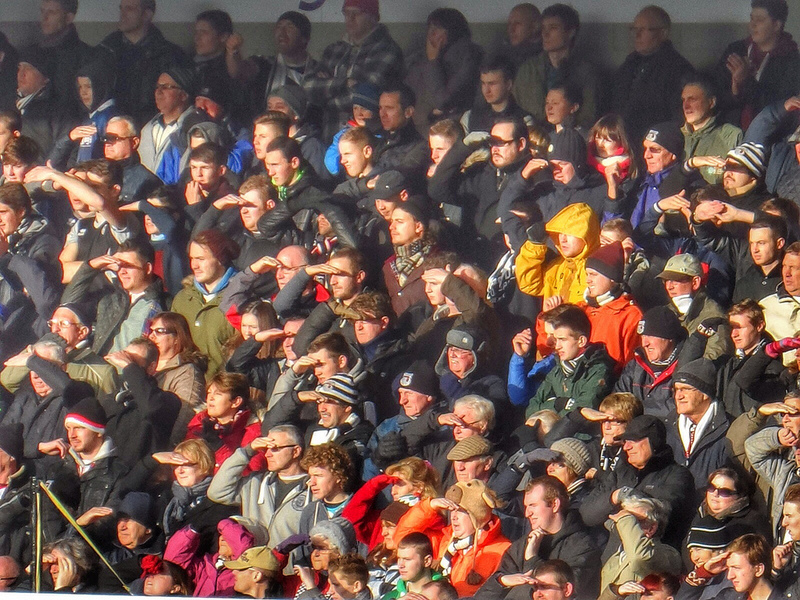 Lincoln’s vocal element were housed in the corner of the Co-op Stand, having been displaced for this game by the 1,700 away fans which was an impressive effort on a day where public transport wasn’t running. The constant noise made by the two sets of fans created an atmosphere that is very rare at Non-League level. Deep down both teams will feel they should be playing at a higher level and I tend to agree. For one that ambition may be realised sooner than the other.